Teaching computer science at the high school level presents diverse challenges throughout Europe, the Middle East and Africa. For example, in Africa, teachers have limited access to training and curriculum resources. In the U.K. or Germany, CS educators sometimes struggle to keep up with fast changing technology or have difficulty demonstrating that computer science can be a rewarding and “cool” career choice. To help teachers address these challenges, the Google CS4HS (Computer Science for High School) grant program provides funding to universities throughout the region to work in tandem with local high schools and middle schools to educate and inspire the next generation of computer scientists, primarily through teacher training workshops. In 2011, Google funded nearly $400,000 towards 21 projects across 13 countries. These projects collectively impacted thousands of teachers and enabled some very exciting projects. For example, workshops run by Strathmore University in Nairobi became a nation-wide training program for teachers in Kenya. 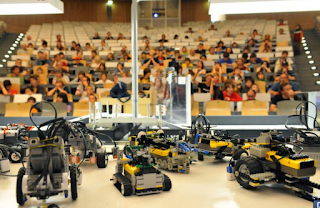 The Technical University of Munich and the Swiss Federal Institute of Technology in Lausanne (EPFL) used the funding to run robotics workshops, with EPFL further focusing on how to engage female students. If you belong to a university interested in applying for 2012, please visit www.cs4hs.com to get more details about the types of programs we are looking to fund. You will also find curriculum modules from past workshops provided for you to use or adapt, as well as examples of a successful past projects and an exemplary application. Thank you to all of our 2011 participants for bringing computer science education to thousands of more students throughout EMEA! is a Google Student Ambassador at Rice University. In this four-part blog series, Rice+, Veronica will share about the various creative ways that the Rice community is using Google+ to enhance their world. Stay tuned for the second post in this series, which will be published in January. Now that the semester at Rice has finished up with a grueling finals period, we Rice Owls are looking forward to eating home-cooked food, sleeping in our own quiet bedrooms, not having to wear flip-flops in the shower, and of course, hanging out with our high school friends. But for my peers and for me, being physically distant from our high school friends didn’t mean that we couldn’t still hang out with them while still at college, thanks to Google+ Hangouts. 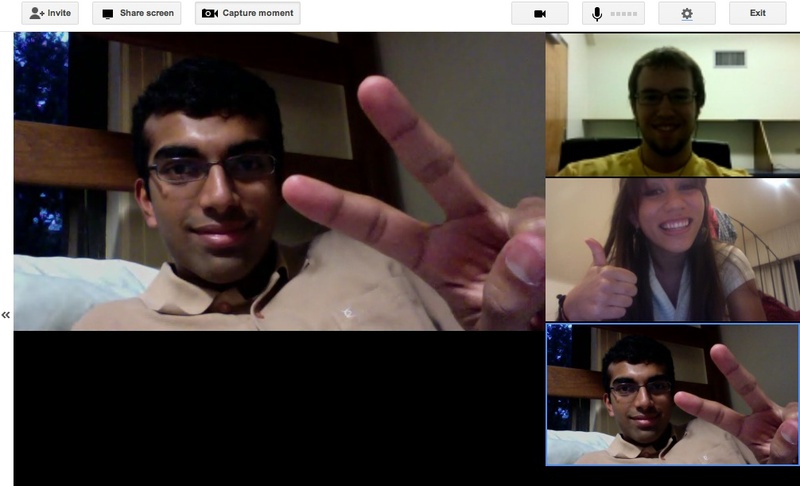 Hangouts are especially fantastic for students at Rice, because our university attracts students from all across the globe. In fact, the screenshot below features my friend Stephanie hanging out on Google+ with her high school friends from Taiwan, who are now at universities in Taiwan as well as across the United States. 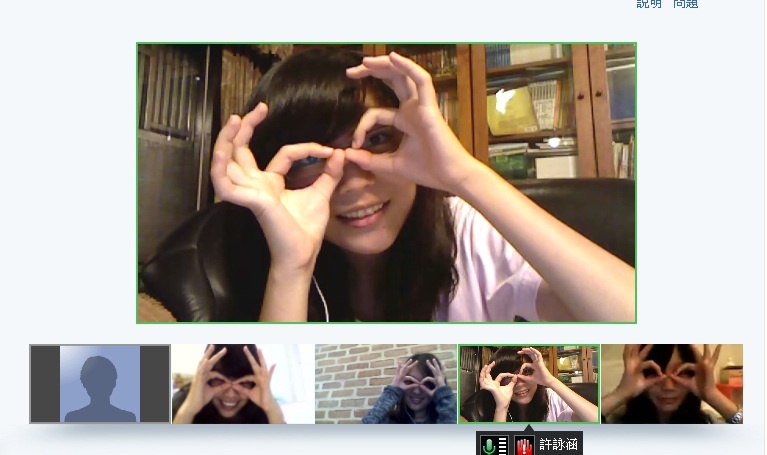 The 10-way, free video chat allows them to still be goofy together despite being far from each other. to keep in touch with her friends across the globe. I even use Hangouts to communicate with my college friends, especially when I’m far from them during breaks, like in the next few weeks! 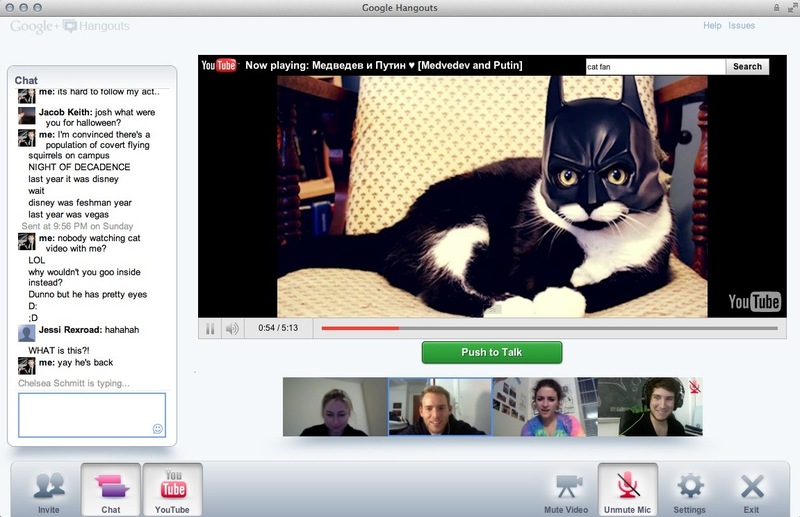 over this winter break, we're able to use Hangouts to catch up and chat. 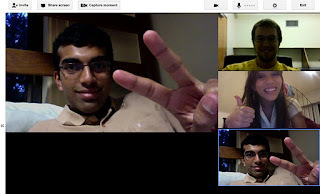 Even over the last summer, my friends and I jumped onto the Google+ bandwagon and used Hangouts to keep in touch and be with each other virtually. This was perfect for us because even though I live in New Jersey, most of my college friends happen to be scattered all around Texas. I mean, a lot of the time when we’re together in real life, we’re relaxing and watching YouTube videos, which we can also enjoy over Google Hangouts. In fact, my friend Josh used Hangouts to watch YouTube videos with his high school friends across the country throughout last semester. How do you use Google+ to enhance your social world? Introduction: Veronica Rae Saron is a Google Student Ambassador at Rice University. In this four-part blog series, Rice+, Veronica will share about the various creative ways that the Rice community is using Google+ to enhance their world. Stay tuned for the second post in this series, which will be published in January. , which brings you the unique stories and experiences of Google interns. Though most interns spend their time working at Google offices over the summer, these interns are putting in their time during the fall and winter seasons. 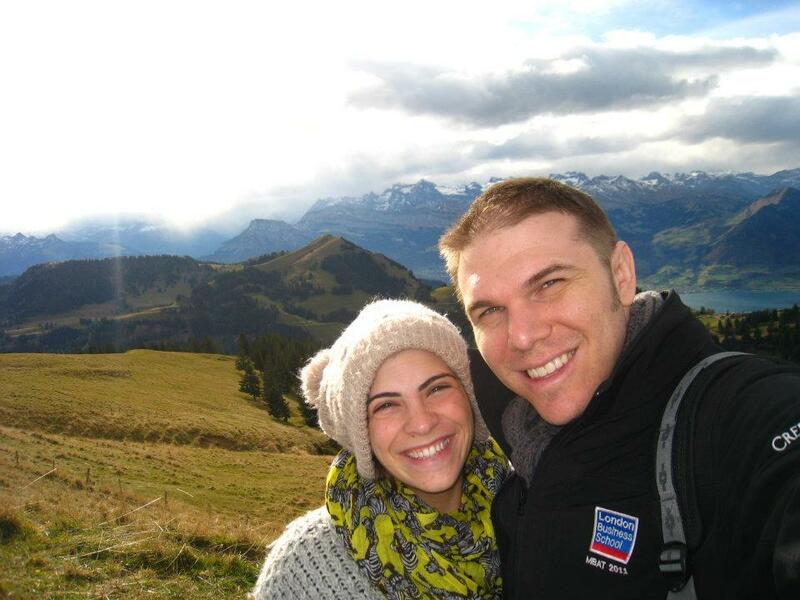 Today’s post comes from Steve Suppe, an MBA product manager intern in Google’s Zurich office. Steve Suppe: I’m originally from Orange County, California, USA (the OC!). I studied computer science at the U.S. Air Force Academy, where in addition to my getting my bachelor’s degree, I also served in the U.S. Air Force as a 2nd Lieutenant. I’m currently studying for an MBA at London Business School. It’s a very international place, which makes for some great discussions—just like Google. You have a bachelor’s in computer science. What drew you to get your MBA? How did you end up in London? SS: After five years working in software engineering, I spent a year as a U.S. Fulbright Scholar in Israel. The Fulbright is a fantastic exchange program that allows you to go out and attempt big things while experiencing life in another country. In my case, it really altered my intended path of a PhD. I worked with IBM Research Labs in Haifa, Israel as a software engineer on distributed search, while also independently starting a social network for volunteers and organizations in Israel. The experience in developing that product, building a team and working with non-profit organizations made me realize how much I loved actually building products, and piqued my interest in an MBA. I chose London for a variety of reasons but most importantly, I feel every year I spend outside the U.S. is so educational. My assumptions are challenged every day, and I’ve learned a lot about the world (mostly that there is so much more to learn!). Tell us about your path to Google. SS: With an MBA you can do many things—banking, consulting, general management, the list goes on. For a long time during my studies I thought I might leave technology behind, but I eventually realized that my heart is in technology and that, one way or another, I would have to incoporate tech into whatever I did. The Google Zurich office posted an advertisement at my school looking for product manager interns, essentially MBA candidates with technical degrees. I really get a thrill when I talk about Google products and the cool, useful features they should have. I think basically everyone has been “wow’ed” by a Google feature at some point in their lives. The allure of helping to build a product that could affect millions of people was too strong to turn down! What’s the Zurich office like? SS: Two things came to my mind the first day. Firstly, “Willy Wonka and the Chocolate Factory.” Every corner (or curve) of the building is designed to stimulate, whether through fun collaborative spaces or comfortable places to work alone. And, despite the seeming chaos, everything seems to flow naturally. Secondly, every person here is sharp and they want to work with you. People are ready to talk about the cool new thing they’re working on, or how they’re going to change the world with their ideas to make the best products. How have you liked interning at Google? What projects have you been working on? SS: I definitely feel I made the right decision coming here. I’m currently working on Calendar. We’re creating roadmaps for a lot of cool new features that are coming down the pipe. We’re also taking a look at how Calendar can better support more of the Google product line. Beyond that, I’ve had the opportunity to lead the charge on developing a lot of internal capabilities that allow us to really understand how Calendar is being used every day. This is a lot of fun, as I use more of my MBA training to think about what drivers of business we really need to measure. What’s the most challenging part of working at Google? SS: The challenging part is also the most fun. Google lets the best ideas compete their way to the top. That means you have to really make yourself heard, and the best way to do that is to talk to every single person you meet. The neat part is that everyone loves good ideas, even if they’re not their own! So while you’re in a never-ending attempt to sell your project, everyone else is too, which means it’s never-ending collaboration as well. SS: Besides technology, my passion lies in music. I’m a writer/performer of original and covered works. I have been playing guitar for 15 years and took singing lessons to help round out my abilities. Playing on stage is great preparation for Google—it gets you over stage fright, and makes you realize that the interesting things you do will get others excited as well. Where do you see yourself in 5 years? 10 years? SS: That’s a good question! Wherever I may be, I hope I’m making great products that people really find make a difference in their lives. Introduction: We are relaunching the Googlers Beta Series, which brings you the unique stories and experiences of Google interns. Though most interns spend their time working at Google offices over the summer, these interns are putting in their time during the fall and winter seasons. Today’s post comes from Steve Suppe, an MBA product manager intern in Google’s Zurich office. One of the things I enjoy most about working on Google’s green team is understanding what gets people interested in green topics. One way to uncover that is to look at the most popular searches. This year’s Zeitgeist, released today, highlights the fastest rising searches in 2011 and includes several categories related to the environment. We could have guessed that solar would be popular, but who knew so many people were searching for backyard chickens and garbage island? I learned a few things, too -- about an earless bunny that created a stir about radiation, and microorganisms that light up Puerto Rico’s famous bioluminescent bay. To explore top green searches in the US in the Zeitgeist, you can find lists in the Science, Tech & Gadgets, and Quirky categories. The lists include top searches in alternative energy, rare wild animals, hybrid and alternative vehicles, environmental questions, what people are reusing, quirky environmental, waste disposal, and sustainability. Google continues to create a better web that’s better for the environment. So it’s encouraging to see that 2011 was another year when people were using the web to find information and resources to make greener choices. We hope that the more we understand about garbage islands, the more we’ll choose to use reusable bags. And the more we understand what deforestation is, the more we’ll want to protect the cute red panda. I’m off to make my 2011 Green Scrapbook to help spread the word! , Shona Brown, announced $40 million in Google end-of-year grants, and we’re thrilled to report that nearly $20 million is going toward supporting education—specifically, STEM (Science, Technology, Engineering and Math) and girls’ education. As a company with computer science at our core, supporting strong STEM programs is in our DNA. We know how important it is to inspire the next generation and introduce students to the possibilities of STEM and CS at a young age. This year, Google.org is funding 15 highly effective STEM programs, including Boston-based Citizen Schools and the D.C. Public Education Fund (both 100Kin10 partners), Generating Genius in the U.K. and Teach for All, four organizations that enrich the learning experiences of underserved youth. In total, our grants will provide enhanced STEM education for more than 3 million students. Our end-of-year giving is also supporting programs that focus on girls’ education, specifically in the developing world. It’s a simple but remarkably powerful fact: give a girl an education and you’ll improve the chances for lifelong success not only for her, but also for her entire family and community. Among others, we’re funding the African Leadership Academy, which awards merit scholarships to promising young African women, and the Afghan Institute of Learning, which provides literacy classes to women and girls in rural Afghanistan. In total, our funding in this area will educate more than 10,000 girls. You can see a complete list of education organizations receiving grants here (PDF). Nonprofit organizations play an increasingly crucial role in making sure that vital services reach the people and communities that need them most, and we are thrilled to be able to support the work of so many incredible organizations. In addition to education, Google.org also chose to give to organizations promoting technology for social good and those fighting against modern day slavery. 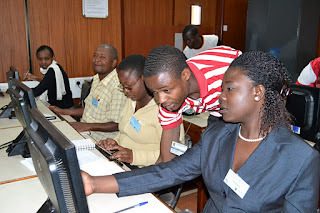 For the complete story of how Google is giving back in 2011, read Shona’s post on the Official Google Blog. Today, our SVP of Google.org, Shona Brown, announced $40 million in Google end-of-year grants, and we’re thrilled to report that nearly $20 million is going toward supporting education—specifically, STEM (Science, Technology, Engineering and Math) and girls’ education. ...and this was about a tenth of it! From materials which helped me as a prospective freshman--campus maps, legal pads with notes about where to apply, notes from my guidance counselor, etc--to my college notebooks, printouts of presentations with comments from group projects and resumes marked up by career services, I was amazed by one thing--how much of my college experience was organized offline. 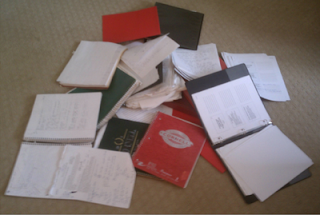 Though I relied on Google products like Gmail to help manage my work and social life as a high-school student, the pile in the middle of my room made me think about how much easier my college experience could have been if there was a site dedicated to giving students ideas about how to use Google tools and products to stay organized in school. 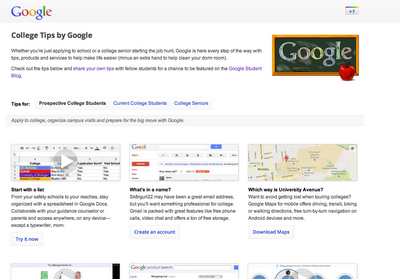 For this reason, I worked with a number of recently graduated Googlers to put together College Tips by Google. Tips for high school seniors to help with the application process, campus visits and getting ready for school. Though I think we’ve put together some cool ways to use Google products for college success, I’m sure we’ve only scratched the surface and would love to hear your ideas as well. As you check out the site, submit your own Google college tips for a chance to be featured right here in your very own post on the Google Student Blog. I hope you find that this new site helps you with everything you need for the best four years of your life--except an extra hand to clean up your dorm room! , which was held in Portand, Oregon from November 9th through the 12th. At Grace Hopper, women from various fields in technology got together to attend conference sessions relevant to their research and career interests, network, and discuss the role of women in technology. Over 80 Googlers attended the conference, many of whom led or participated in panels or sessions on topics such as What If... There Were More Women in Technology? The Business Case for Diversity, Returning to Work after Maternity Leave: Can You Have the Best of Both Worlds?, and Technology for Non Profits and Start Ups: How to Identify Tools and Teach Enterprises How to Leverage the Web. Googlers also participated in K-12 networking sessions and hosted a project in the conference’s Open Source Codeathon for Humanity, fixing known issues for Google Person Finder. The Grace Hopper Celebration of Women in Computing is presented by the Anita Borg Institute for Women and Technology and the Association for Computing Machinery. For more information, please visit the Grace Hopper conference site. For more information on all of our scholarships and student programs, visit www.google.com/students. Google was a proud platinum sponsor of the 2011 Grace Hopper Celebration for Women in Computing, which was held in Portand, Oregon from November 9th through the 12th. At Grace Hopper, women from various fields in technology got together to attend conference sessions relevant to their research and career interests, network, and discuss the role of women in technology. When I was in school during the 90s, watching videos in the classroom was a highlight of any week. The teacher would roll in a television on a cart, pop in a VHS tape, and then we’d enjoy whatever scratchy science video my teacher had checked out from the school video library that week. Sight, sound and motion have always had the power to engage students and complement classroom instruction by bringing educational topics to life. We’ve been hearing from teachers that they want to use the vast array of educational videos on YouTube in their classrooms, but are concerned that students will be distracted by the latest music video or cute cat, or a video that wasn’t appropriate for students. While schools that restrict access to YouTube may solve this distraction concern, they also limit access to hundreds of thousands of educational videos on YouTube that could help bring photosynthesis to life, or show what life was like in ancient Greece. To address this issue, we’ve developed YouTube for Schools, a network setting that school administrators can turn on to grant access only to the educational content from YouTube EDU. Teachers can choose from the hundreds of thousands of videos on YouTube EDU created by more than 600 partners like the Smithsonian, TED, Steve Spangler Science, and Numberphile. We know how busy teachers are, and that searching through thousands of videos sounds like a daunting visit to the world’s largest library, so we’ve also worked with teachers to put together more than 300 playlists broken out by subject -- Math, Science, Social Studies, and English Language Arts -- and by grade level. Teachers can find them listed out at youtube.com/teachers. Of course, this list wouldn’t be complete without your input -- teachers, what videos do you use in your classroom? Suggest your own education playlist here. YouTube for Schools is just the latest initiative in our ongoing attempts to make YouTube a truly valuable educational resource, and to inspire learners around the world with programs like YouTube Space Lab. So how do you get started? To join YouTube for Schools or learn more about the program, head on over to www.youtube.com/schools. Recruiter Tips & Tricks: You've accepted a job offer...now what? , Lead Engineering Recruiter Jeff Moore has been writing weekly posts for our Recruiter Tips & Tricks series. His posts have covered a wide range of topics from how to navigate a career fair to tips for acing a technical interview. This week he wraps up the series with a post that discusses what you should keep in mind once you accept a job offer. Can't get enough of Jeff's tips? Keep an eye out for him on the Google Students page on Google+. You never know where he may show up! Hopefully all the stuff we’ve talked about the last three months has paid off (if it hasn’t...it will!) and you’ve decided on a job. Awesome! Congrats! The only thing left is to show up on your first day right? Wrong....as crazy as it sounds there are still things you need to do to prepare for your new job. Finish your degree - The most obvious tip of them all...I’ve been saving this one for the last post. Chances are, the offer you just accepted is contingent upon you completing your degree. And you didn’t think it was important to read the fine print, eh? So, even though you’ve got a job and you’re feeling good about your future...don’t lose sight of the present and finish your education. Stop interviewing - And the second most obvious tip of this series...seriously, once you accept a job it’s time to stop interviewing with other companies. Honor your commitment to your new employer. Keep up to date on your future employer - The tip here is to make sure that you are up to date on the biggest issues facing your current employer. You don’t need to be obsessive about this but you also don’t want to be the person who shows up on your first day to find out the company went out of business 3 months ago...yet no one called to tell you the news. Additionally, keeping up to date will allow you to be prepared for anything on your first day and show your new boss that you’ve been committed and excited about the role since you accepted. Get your life in order - Before you start this next adventure in your life, make sure you have a place to live, transportation to/from work and everything you need to be able to focus on work from day one. The last thing you want to do is show up to work disheveled and distracted because your personal life is a mess and you’re worried about where you’re staying next week. Take the time and energy you need to get settled and show up on your first day fired up and ready to go! Enjoy your last few months as a student - You still have some studying to do, but with your job hunt out of the way you should have more time to relax and enjoy these last few months of student life! Soak up the campus experience, spend quality time with your friends (who will soon be scattered all over the world), and celebrate. You worked hard, you earned it. Ok, that’s it this week and for this series. I hope we’ve been able to help those of you starting out with your career and found a few of these tips to be helpful. For those of you still looking for a job; keep networking and good things will happen. Good luck out there! Introduction: Since September, Lead Engineering Recruiter Jeff Moore has been writing weekly posts for our Recruiter Tips & Tricks series. His posts have covered a wide range of topics from how to navigate a career fair to tips for acing a technical interview. This week he wraps up the series with a post that discusses what you should keep in mind once you accept a job offer. Can't get enough of Jeff's tips? 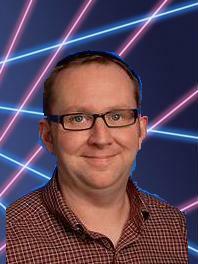 Keep an eye out for him on the Google Students page on Google+. You never know where he may show up! founder Salman Khan and Stanford AI class professors Peter Norvig and Sebastian Thrun (also Googlers). They will discuss their work and vision for reinventing education, and their virtual office doors will be open for you to ask them questions live. The Google+ hangout will be broadcast live on +Khan Academy for you to drop in and ask questions. If you can’t make it or prefer submitting questions via text, please post and vote on questions on the Google in Education YouTube page anytime before office hours begin on Friday. Join us on Friday by adding the Khan Academy Google+ Page to your circles. You will have a chance to actively participate or watch the office hours from the Khan Academy page. Please be patient, just like real office hours, sometimes you have to wait to join. Our goal with this Google+ Office Hours series is to make global industry thought leaders accessible to you, and give you the opportunity to share your thoughts with and ask questions of them. You never know who your ideas might inspire next. We’d also love to hear from you in the blog comments below. Who’d you like to see join Google+ Office Hours next? See you in Office Hours! This Friday, December 9 at 1 pm PST / 4 pm EST, we’re kicking off our monthly Google+ Office Hours series with three pioneers in online education, Khan Academy founder Salman Khan and Stanford AI class professors Peter Norvig and Sebastian Thrun (also Googlers). They will discuss their work and vision for reinventing education, and their virtual office doors will be open for you to ask them questions live. of young people from the region. This is the one-week Google Student Ambassador (GSA) training in Cairo, our biggest university event so far. Earlier in the summer, we launched the GSA program. We received almost 900 applicants and selected 72 of them to represent their universities for one academic year. GSAs serve as conduits between our offices and university campuses all over the world. After orientation, each GSA returns to campus to plan social and networking events, hold tech-talks about various study and Google related topics, distribute Google goodies, launch awareness sessions to spread knowledge about Google’s latest tools, products and technologies and finally to encourage their classmates to learn more about Google’s various university programs. “First Dip” day—GSAs learned more about Google as a company. For example, how search works, how Google makes money, and Google’s efforts in the MENA region. We also went over what being a GSA is all about. “Take a Deep Breath” day—GSAs learned about specific tools for two different tracks. We ran a search and monetization workshop for business students and a web technologies workshop for engineering and computer science students. All the GSAs also learned how to write a CV and attended an internship panel where they heard from and were able to ask questions to Google’s Egyptian interns. “Efficient and Effective” day—Four hours of Google Apps training run by the Egyptian Google Apps partners, plus a module on leadership and effective communication skills. “Shine Like a Star” day—How to deliver a charismatic presentation, how to talk to the media, creative thinking techniques and project, event and budget management skills. The day capped off with a simulation of an on-campus event so GSAs could get hands-on practice. “Graduation Day”—Discussions about the value of volunteering and helping communities and colleagues. We also reviewed the best practices of internet activity, like safe browsing, cyber security and ensuring data privacy. At the end of the day, everyone graduated with honors (and a bag of Google goodies)! Many newly appointed MENA GSAs described the training as the best week of their life, which we were all too happy to hear. The purpose of this week is not just to introduce them to the logistical aspects of being a GSA, but to help all these ambitious students feel like they are part of something bigger than themselves, and turn them all into people who are eager to learn, and share that knowledged with others. We look forward to seeing them help their universities by putting all the knowledge they gained into action. For the first time in the Middle East and North Africa (MENA), in the middle of New Cairo’s desert and summer heat, over 20 Googlers have come together from all around the world to meet, greet and train a select group of young people from the region. This is the one-week Google Student Ambassador (GSA) training in Cairo, our biggest university event so far. I still recall the day when my friend Yossi came to school and showed off his brand new graphing calculator. I was stunned by how easy it was to plot complicated functions -- meanwhile, the rest of us were still drawing them by hand on graph paper. Today, I’m hoping to share that magical feeling with students around the world, with the introduction of graphing functionality on Google. 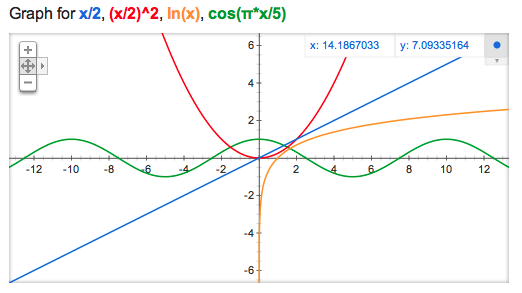 Now you can plot mathematical functions right on the search result page. 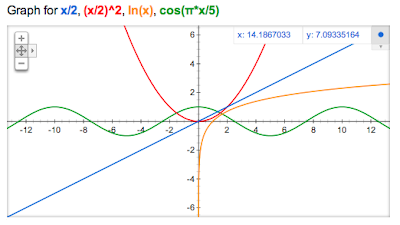 Just type in a function and you’ll see an interactive graph on the top of the search results page. You can zoom in and out and pan across the plane to explore the function in more detail. You can also draw multiple functions by separating them with commas. This feature covers an extensive range of single variable functions including trigonometric, exponential, logarithmic and their compositions, and is available in modern browsers. I hope students and math lovers around the world find this experience as magical as I found the graphing calculator so long ago. 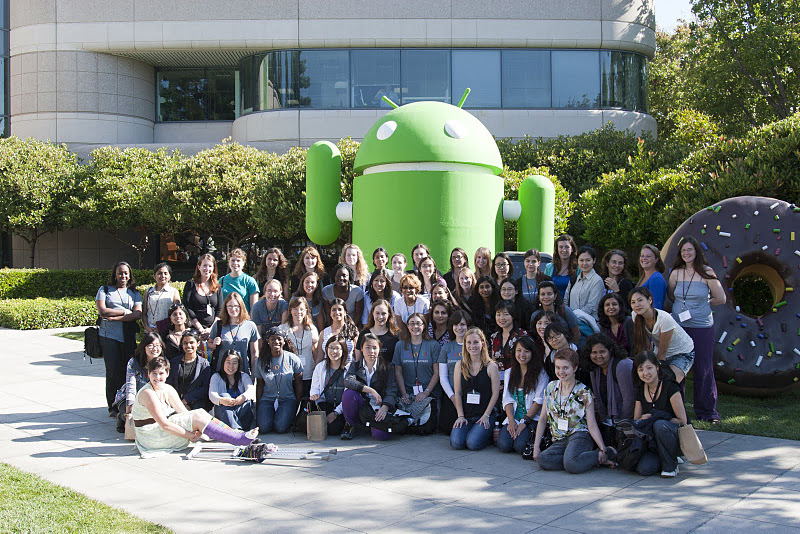 The Google Anita Borg Memorial Scholarship is open to current female students who are entering their senior year of undergraduate study or enrolled in a graduate program in the 2012-2013 academic year at a university in the United States or Canada. Students should be enrolled in a computer science, computer engineering or a closely related technical program, and maintain a record of strong academic performance. Scholars and finalists will be announced in May 2012 and will be invited to attend the annual Google Scholars’ Retreat—a three-day networking retreat at the Googleplex in Mountain View in the summer of 2012. For those of you outside of North America, the Google Anita Borg Scholarship program is also available in Asia, Africa, Australia, Canada, Europe, the Middle East and New Zealand—visit www.google.com/anitaborg for more information. Finally, the Anita Borg Scholarship is just one of many scholarships and networking opportunities we offer to students in order to encourage them to excel in technology and become active role models and leaders in the field. For more information about all of Google’s scholarship programs, please visit www.google.com/jobs/scholarships. Dr. Anita Borg devoted her life to revolutionizing the way we think about technology and dismantling the barriers that keep women and minorities from entering the computing and technology fields. In honor of Anita's vision, we established the Anita Borg Memorial Scholarship in 2004, awarding scholarships to women who share her passion for technology. Once again, we’re proud to announce the Google Anita Borg Memorial Scholarships in the U.S. and Canada. The deadline to apply for the 2012 scholarship is Monday, February 6, 2012. This Sunday marks the start of the third annual Computer Science Education Week (CSEdWeek), taking place in the U.S. from December 4-10. CSEdWeek underscores the need for strong computer science education programs to ensure the nation has a pipeline of future workers skilled in technology. It’s a call to action that urges local efforts by parents and teachers to not only pay attention to CS education, but also to elevate its status and quality. report from the Association for Computing Machinery (ACM) and the Computer Science Teachers Association (CSTA) found that only nine states count high school computer science courses as a core academic subject in graduation requirements. You don’t have to be an engineer to do the math here—if things stay this way, there will be a shortage of skilled workers to fill these valuable jobs. We want to increase access to education and technology for all students, which is why we support initiatives like CSEdWeek that are vital to accomplishing that very goal. CSEdWeek is a chance to eliminate misperceptions about CS and computing careers and increase awareness about all the opportunities understanding computing enables. Furthermore, a high-quality education that includes CS teaches students skills and processes that will benefit them no matter what field they choose to go into. The overarching goal is to have K-12 computer science become one of the core disciplines in our national education system. Students can celebrate CSEdWeek and spread the word by changing their Google+, Facebook, Twitter or other social media profiles to a computer scientist you identify with most. Teachers can use CS Unplugged to teach lessons that explain how computers work, and at the same time, address critical mathematics and science concepts from number systems and algorithms to manipulating variables and logic. Anyone can “Take the Pledge” to join in and/or support teachers, students, parents and others who are participating in CSEdWeek activities and events. CSEdWeek is a major activity of Computing in the Core (CinC), a non-partisan coalition of which we’re proud to be a member, alongside other corporations, associations, scientific societies and nonprofits striving to elevate computer science education to a core academic subject in K-12 education. Including CS as a core subject will give young people career-readiness knowledge and the skills necessary to thrive in a technology-focused society. For additional information on CSEdWeek or to find out about events for students, parents and educators in your area, please visit the CSEdWeek website: www.csedweek.org. start - Companies have a lot of requirements around start dates (i.e. everyone starts on Monday). Tell your recruiter or manager when you graduate and then ask them when they’d like you to start. You may find that the date they’d like you to start is a perfect date. Be Realistic - Remember, you’re picking a date that might be six or eight months away, so there is a high likelihood it will change. However, you want to be realistic and pick a date that seems reasonable based on when you are finishing school. If the company wants you to start the day after graduation but you’d rather take a few weeks off to get life in order, you should politely push back and let them know what you’d like to start a few weeks later so you can be 100% focused on the new job. Communicating honestly with your future employer will go a long way to starting your relationship together on the right foot. No Surprises - Planning to hike across Europe? Sail around the world? Those things are all cool—very cool, actually—but make sure you’ve communicated your plans to your recruiter or hiring manager. Being upfront and honest about your plans is the responsible thing to do and your future colleagues will appreciate your honesty (and probably be a bit jealous of your plans). Stick to your commitment - Don’t move your start date around constantly. You’ll drive your future boss crazy as they won’t be able to properly plan your on-boarding. Your start date is your first chance to make an impression as an employee, not as a candidate. You want to make sure you can show your team that you are able to stick to your commitments and show up when you say you’ll show up. That’s it this week. Good luck wrapping up your offers and finding time to study for finals....with all this talk about jobs you can’t neglect your classes! Introduction: We're starting to wrap up our Recruiter Tips & Tricks series, which has featured insight for students on the job hunt from Lead Engineering Recruiter Jeff Moore. Today Jeff talks about what you should consider when choosing a start date. Welcome back everyone! If you started your job hunt in the fall, there's a chance you may have already received a few offers and may even be making your final decision on what company to join. (If you're not at this point yet, don't worry, there's still plenty of time left in the recruiting season, and you can keep this week's tips in mind for later.) Once you’ve accepted an offer, though, you need to get down to the business of picking a start date. Sounds easy right? Well, it can be harder than you think and here are few thoughts on how to pick a great start date and make a solid first impression with your future employer. Ask when you should start - Companies have a lot of requirements around start dates (i.e. everyone starts on Monday). Tell your recruiter or manager when you graduate and then ask them when they’d like you to start. You may find that the date they’d like you to start is a perfect date.